For the first time, physicists have observed a mysterious process called magnetic reconnection—wherein opposing magnetic field lines join up, releasing a tremendous burst of energy. The discovery, published today in Science, may help us unlock the secrets of space weather and learn about some of the weirdest, most magnetic objects in the universe. 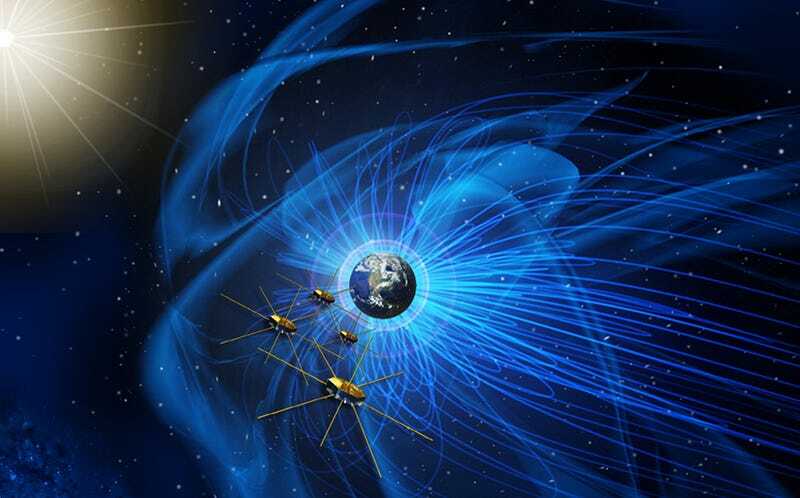 The magnetosphere, an invisible magnetic field surrounding our planet, is a critical shield for life on Earth. It protects us from all sorts of high energy particles emitted by the sun on a daily basis. When a particularly large burst of solar energy hits the edge of the magnetosphere (called the magnetopause), it can trigger space weather. This includes geomagnetic storms that light up the northern and southern skies with auroras, occasionally knocking out our satellites and power grids. A better understanding of space weather is key to helping us prepare for the next massive geomagnetic storm—a once-in-a-century event that could quite literally cause a global power surge. Magnetic reconnection is at the heart of the mystery, underlying both the formation of solar eruptions and how they interact with our planet. What Would Happen if a Massive Solar Storm Hit the Earth? Now, for the first time, Burch and his colleagues have observed that sun-Earth connection at the subatomic scale, using data collected by NASA’s Magnetospheric Multiscale (MMS) mission. This high-resolution physics laboratory consists of four identical spacecraft that fly in pyramid formation around Earth’s magnetopause, collecting precise information on tiny charged particles every 30 milliseconds. Burch and his colleagues are continuing to study five other instances of magnetic reconnection recently observed by the MMS, and they’re hopeful the mission will yield more events for years to come. In addition to shedding light on space weather, magnetic reconnection can help us understand exotic astronomical objects like magnetars, as well as the strong magnetic environments created by fusion reactors.